Dr. Richard Matthew, CUSA’s Director and UCI’s Professor of Planning, Policy and Design and Political Science, has recently finished a four volume series detailing the main and most imperative topics of environmental security. The literature compiled in this collection explores the real and potential linkages between environmental change and security. 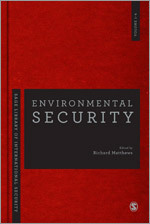 Early formulations of environmental security date to antiquity, whilst contemporary formulations of environment-conflict-peace linkages grew in part from the environmental movement of the 1960s and 1970s. The ensuing flood of academic enquiry has been diverse and extensive, and the objective of this major work is to organize this important but polysemous literature in order to provide a comprehensive, historically rich and global overview of its key concepts, findings, contributors and methodologies. To purchase or learn more about it, the volume set is available online at SAGE Publications.